When buying your first home, there are many items and matters you need to consider. Sometimes it is hard to know who you can trust for the right help in the areas you require assistance with. Especially if you are buying or renting for the very first time. Introducing our FHBA Services Community. Aimed to assist first home buyers & savers find experts they can trust (& can ultimately help them), we have put together an online community of experts you can have confidence in for assistance throughout your property journey. All of the experts in our FHBA Services Community are Australians business’s, with Australian staff. The various specialists have years of experience and renowned reputation for assisting first home buyers or savers. So you know you can trust them to assist you with all your property queries. Look for the FHBA Services Community badge when engaging a property specialist to assist you with your first home. 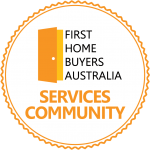 When you see the badge you know they are Australian experts with years of experience in assisting first home buyers & savers just like you. Easing the pressure on first home buyers when they move into their first home. Empowering FHBA Mortgages by providing expert mortgage brokers across the country.